If you are keen to watch sports channels like international soccer or rugby matches, and drink & chat when every other shop has closed, then this is a great place to come. Ask any local where to go after it's past 3am when other bars have already closed down, they will recommend Chillout Bistro. It's located in Pantai Tengah and close to its northern end and tucked in between other eateries and restaurants. You will need to go right of Aseania Hotel and go around the corner. It may not be easy to find, but it is on the main road that leads to hotels like Holiday Villa etc. The entrance is through swaying palms and other green plantations. Inside the ambience is very lively, cozy and friendly. You will need to sit on barstool like tall chairs without backrests that are placed all across the room with small tables to keep your glass. This is a place which is frequented by many locals and expats. So if you want to have a friendly chat with locals and drink with them, this is a great place to come. The owner himself is a great attraction and can challenge you to a great game of pool. Yes, there is a nice pool board here as well. 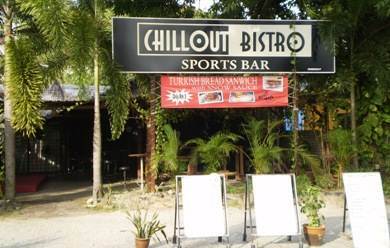 But Chillout Bistro is most well known as a sports bar with several large good quality LCD screens showing sports channels all the time. The TV reception quality is also great. Occasionally there is also a live band here playing music. Beer and the other drinks are very reasonably priced. Try out the Turkish Bread Sandwich with snow sauce ... only RM5. I love it. You will get several other snack items as well. You can walk in. No reservation is required. Update 2014: Chillout Bistro has closed down and building demolished for other developments.